Why do students refer to writing services? The reasons may be different, but the main purpose is one – to get the best result for the minimum amount of time. Nowadays the industry is developed so much, that it is really hard to say which service is good and which one is bad, without trying them out. The mission of our team is to inspect them for you. You do not need to risk your time, money, grades or in some cases even degree to find the most reliable writing services and detect the swindling ones. This time we are presenting our review on Essayempire.co.uk. According to the company, Essayempire.co.uk. offers the widest range of writing assignments. Here you can order the most popular papers, such as essays, courseworks, term papers, as well as offbeat ones, like Math problem solving or multiple choice questions. In the “Prices” section we see that dissertations are also available, although in the online order form the range of academic levels is limited to 3 only: high school, undergraduate and master. However, what if you need a doctoral one? What looked weird enough for us is our attempt to contact their support team and ask them about the services and types of papers available. We sent our live chat message and waited 10 minutes. As we got no response, we decided to call them. There was no answer either. So, we guessed that this service is not very much interested in customers and orders. But what if we had much more serious questions and pressing deadlines? The answer is evident: this service would not be able to help us. Talking about urgency, we need to mention that their minimal deadline is 24 hours, so do not count on their quick help. Plus, you cannot be sure if your order is proceeded right after it is placed. If their support team is not available 24/7 as they claim on their site, how can you trust them your urgent and highly important tasks? Our experience shows that from this point of view the service is not reliable, and in case of urgent writing it is better to find another company. What About the Prices, Discounts and Refunds? The service is quite expensive. The prices are only in UK pounds and start from 13£ per page, which is way too much. There are lots of other writing services that offer the highest quality and real round-the-clock support for less than 10$ per page. The discounts are available, but not on a regular basis, so you have to constantly keep yourself updated with their service. In our opinion, it is not convenient for a common customer. Plus, there is a big chance that the discounts will be available when you will not need them, and there will be none of them when you will be placing your order. The refund policy is pretty standard. You can get your money back in the cases of plagiarism, company’s failure to meet the deadline, bad quality and no response from the support department. However, the percentage of refunds is not specified, and the procedure of getting money back is quite difficult. You will have only 7 days to claim for a refund, during which you will have to try really hard to prove that the quality is unacceptable. So, think twice before paying to this service. 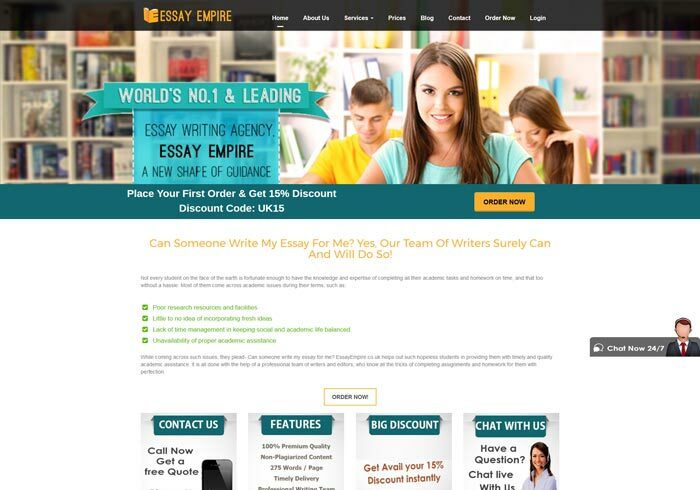 Essayempire.co.uk claims to be a high quality, punctual, professional and customer-oriented writing service. We, however, have found out that it is not completely true. In reality the support department is hard to contact, the prices are high, urgent orders are not available. In comparison to other wring services Essayempire.co.uk does not look reliable enough to be recommended by our team.